Laser tattoo removal is a simple aesthetic procedure with minimal complications. And just like when your tattoo was applied, proper aftercare by you is important to achieve optimal results. We will explain in detail what to expect following your treatment and will also provide printed aftercare instructions for you to take home. In general, for at least several days after each treatment you must keep your tattoo: clean (to prevent infection); coated with A&D ointment (to prevent scab formation); and covered with a sterile dressing (to prevent abrasions and sun exposure). Our expert laser technicians are trained to observe the appropriate clinical response on your skin during your treatment. It is important to note that what you experience after your treatment has no bearing whatsoever on the effectiveness of the treatment you received. A key benefit of our advanced laser technology is that it greatly reduces the incidence of unwanted side effects on your skin post treatment. Every client, every tattoo, and even every treatment is completely unique. Sometimes you might experience essentially no noticeable effect on your skin post treatment: this is a normal response. Other times you might experience swelling, bruising, blistering, pinpoint bleeding, etc. on your skin post treatment: this is a normal response too. The fading of ink post treatment occurs very slowly during the weeks between your treatments. 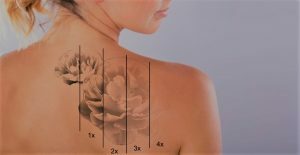 If your tattoo was heavily applied it might take several treatment before you are able to visually notice significant fading of ink. Immediately post treatment your tattoo was coated with A&D ointment (or similar) and then covered with a sterile dressing. Keep this initial dressing on until you next have a shower. Before your shower, gently remove the dressing and throw it away (if you were given a reusable bandage wrap, set this aside for later use). In the shower, gently clean your tattoo with a mild soap and then gently rinse (never scrub your tattoo). After the shower, gently pat your tattoo dry with a clean towel, gently apply a thick layer of A&D ointment, and then cover with a sterile dressing. Follow this protocol for at least three days. In order to minimize swelling, blistering, and discomfort: apply cold compresses as needed (on top of the sterile dressing); rest and elevate the part of your body that was treated; take common household analgesics such as ibuprofen and naproxen as needed (do not take aspirin). Blistering is common, especially after later-stage treatments and also after treatments targeting certain colors of ink. Blisters heal very well and are part of the normal healing process, so do not be alarmed. Small blisters tend to be reabsorbed by the body seamlessly, while larger blisters tend to “pop” within a few days. It is important to keep blisters extremely clean, coated with A&D ointment, and covered with a sterile dressing. Please contact your clinic with any questions regarding blisters. Itchy skin on the tattoo is common, and in most cases is relieved by A&D ointment. If itchy skin persists, you may also use an over-the-counter hydrocortisone cream as needed. Avoid immersing your tattoo in water (e.g. baths, hot tubs, pools, rivers, lakes, oceans, etc) until the skin is healed. Do not pick at any scabs, crusts, or blisters, or allow the skin to become scraped, as this may result in infection and scarring. Shaving over the tattoo should also be avoided until the skin is completely healed. Avoid exposing your tattoo to the sun as much as possible throughout the entire tattoo removal process. Thoroughly protect against sun exposure by covering your tattoo with a dressing, clothing, or SPF50 sunscreen. We are here to help, so please contact us if you have any questions!